Grandma's house was one of my favorite places to be. When I ponder on the "why" of that, I find peace and acceptance in that place. There is no recollection of strife and especially no memory of a face that showed any disappointment. My memories at "Gramma's" were full of wonder and exploration, new adventures and old relics, good cooking and big gardens. It was wonderful. Everyone should have a place where they feel totally loved and safe like I did. 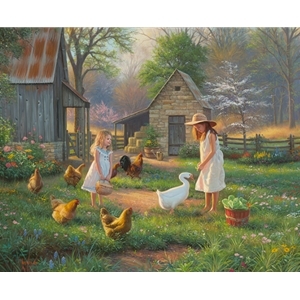 In Evening at Grandma's, I want to remind everyone of that happy place, where we are free to discover things on our own, accidentally let the chickens out, paint outside the lines, and rummage through the stuff in the back of the barn. I hope you have that in your memory and still have it in your present - for it is true living.